Spring is happening! Each day, the sun stays out just a bit longer and up north, the snow is old, feeble and on its way to a wetter, more fluid existence. However, for those of us living the birding life, Spring is more than just the transition between the cold and the warm. It’s also a big time for bird movements, a period punctuated by waves of migrants, first the early ones, then a time of many species, and finally, those last “late” migrants moving north. This is the vital time to get outside and see what’s around because lifers could be in the neighborhood, rarely seen species might be just around the corner, and each and every “regular” bird is decked out in beautiful breeding plumage, many also filling the outdoor audio scene with song. 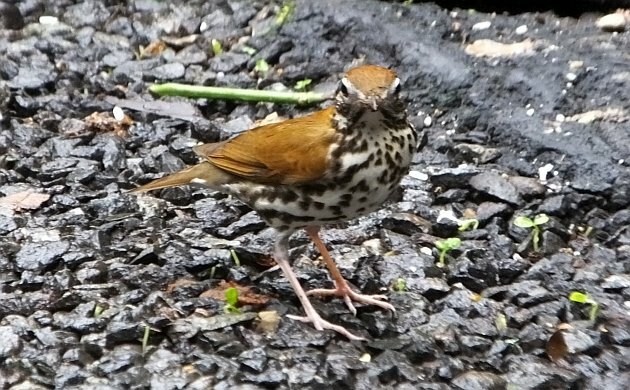 Wood Thrushes are already singing in some places, although not in Costa Rica. Some of those migrants don’t have far to go but the majority of species are winging their way in from Mexico, Central America, and South America. It’s a journey so incredible that it can be hard to imagine or believe but thanks to GPS tracking devices and observations, we know where a lot of those northern migrants go and we know how long they stay. Several come to Costa Rica and a lot of those are, right at this moment, on the move. Many of the early migrants like Louisiana Waterthrush and Prothonotary Warbler have already left. Some are still around but any day now, it will be exceedingly difficult to find them on mountain streams and in coastal mangroves. 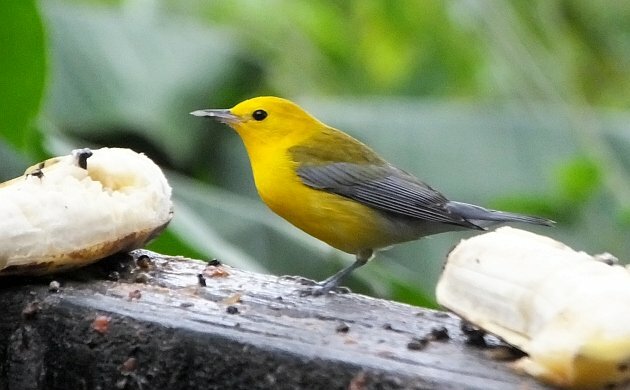 This Golden Swamp Warbler was bulking up on bananas at a middle elevation site in Costa Rica. One of our most abundant wintering species, the Chestnut-sided Warbler has been changing its gnatcatcher-like winter plumage for smart breeding colors. The same goes for Blackburnian and even Tennessee Warblers. Some Tennessee Warblers also feast on bananas. Most other common boreal migrants in Costa Rica are also preparing to fly north under tropical night skies. 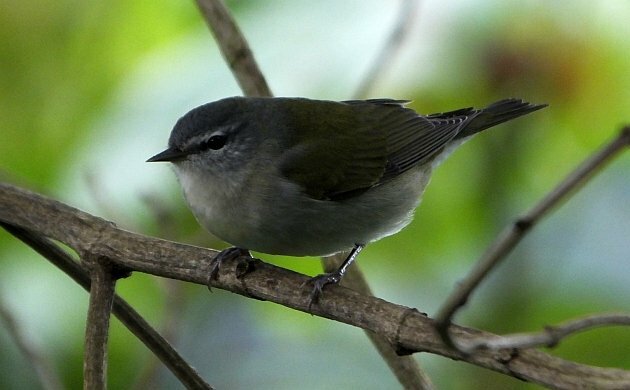 These are birds like Great-crested Flycatcher, Yellow-bellied Flycatcher, Philadelphia and Yellow-throated Vireos, and Wilson’s Warbler. While our winter residents bulk up to head north, they are joined by other species coming from South America. One of those is Cerulean Warbler, the first reports of which came in during the last two weeks. More should be moving through very soon, mostly on the Caribbean slope. Much more common are Swainson’s Thrush, Eastern Wood-Pewee, Scarlet Tanager, Red-eyed Vireo, and Eastern Kingbird. These birds move through in large numbers and are already starting to shake the foliage in the Caribbean lowlands. In the skies above, thousands of other birds are more obvious as they move steadily, constantly north. These species are the ones that form an avian river along the Caribbean coast and other parts of the northern lowlands and include literally millions of Chimney Swifts, Cliff and Barn Swallows, Turkey Vultures, and Swainson’s and Broad-winged Hawks. 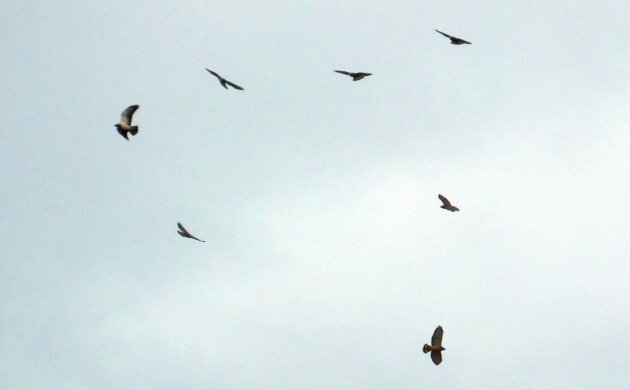 Swainson’s and Broad-winged Hawks making the long journey north. For many, Costa Rica is close to the halfway point. To add to the avian excitement, aquatic birds are also on the move. Go birding in Costa Rica during the next few weeks and you will probably catch some of that spring migrant action. I plan on bearing witness to the ongoing event, with luck, I will find something rare mixed in with the droves of regular spring migrants. No matter what I find, I know that the birding will be fantastic.